Public speaking isn’t a natural inborn skill. Those speakers who make it look so easy have studied and practised the art, and so can your people. 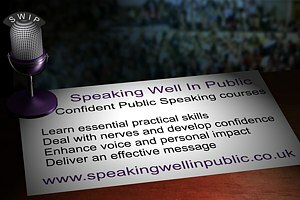 Our acclaimed one-day course will introduce the skills – and the pleasures – of Confident Public Speaking for business. Whatever your field, the ability to stand up and speak about your business in public is a vital part of your people’s personal and professional toolkit, yet so many are nervous of public speaking. Leaders need to communicate an organisation’s vision and goals. The ability to speak well in public is a vital leadership skill, yet it can be a task that people dread and avoid. Your trainers and coaches need to be able to build your organisation’s capability. To develop others effectively, they need top quality speaking, training, facilitation and coaching skills. And if you’re planning a series of outplacement events, giving your people the ability to present with confidence in an interview can mean the difference between their winning and losing that new role.